247 pages | 46 B/W Illus. Outlining the critical need to apply innovation to reduce costs and improve efficiency in the healthcare industry, Unlocking Sustained Innovation Success in Healthcare explains why innovation management is a must for all healthcare organizations. It describes how innovation, when implemented as a strategy, can yield sustainable success. This book is the first in a series that examines how ENOVALE™ innovation process management operates for a specific market group. The ENOVALE process integrates practical innovation management techniques and scholarly research. Supplying insights garnered through research conducted at the Project Impact Institute, the authors present their own innovation process management technology that enables innovation to flow upward from individuals within your organization. They also detail a strategy for ensuring effective innovation process management and project success. The book demonstrates how the ENOVALE process is used and how it can provide for innovation success in the healthcare sector. Numerous examples of various healthcare businesses and practices illustrate the key principles and practices of the ENOVALE process. 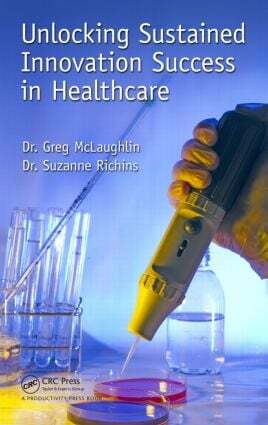 The book includes a chapter on leadership in the healthcare sector that demonstrates how to apply the methodologies discussed to achieve sustained success. It also includes a chapter on innovation and the individual that explains how companies, organizations, and non-profits can benefit from the ENOVALE approach. Describing how high-performing organizations can create a strategy and build a culture of innovation and learning, the book includes extensive citations of authors in the field who add value and justification for the practices covered in the text. After reading the book, you will gain an understanding of how to foster and apply the power of innovation to reduce costs, while increasing the quality of care provided in your healthcare organization. Can Originality Benefit the Healthcare Organization and Professional Outside of R&D? Dr. Greg McLaughlin possesses a unique talent for taking strategic visions and ideas, and turning them into operational realities. He creates value in organizations through his ability to solve complex problems, recognize hidden or unexplained data patterns, and by creating practical, ready-to-implement solutions. Over the past 30 years, he has developed a passion for innovation excellence resulting in the creation of the ENOVALE™ process. His colleagues refer to him as a "Renaissance Man," given his diverse sets of life and work experiences that include innovator, hurricane forecaster, author, Six Sigma/Lean "guru," published songwriter, and Deacon. Greg’s diverse background includes extensive time working with management/project methodologies for innovation success. He created the first set of comprehensive Black Belt materials for the Six Sigma Academy, where he was credited with over $300 million of cost savings over a five-year period. In addition to his Senior Master Black Belt status, he honed his skills as a quality management consultant working directly for Dr. W. Edwards Deming. Greg has held two executive positions in the manufacturing, medical products, security, and process industries. He was the CEO of Inthesis, Inc., a successful business intelligence company. He is currently senior vice president for research and development at Global Targeting, Inc., an international strategy and advising firm dedicated to sustained innovation success. Publication credits include numerous academic and practitioner journal articles, author of Total Quality in Research & Development(1995), and the primary author of Chance or Choice: Unlocking Innovation Success(2013), ENOVALE: How to Unlock Sustained Innovation Project Success(2013), Leading Latino Talent to Champion Innovation(2013), and Unlocking Sustained Innovation Success in Healthcare(2014). His educational achievements include a doctorate in business administration from Nova Southeastern University, and a master of science degree in statistics, and an undergraduate degree in meteorology from the Florida State University. Greg was the director of doctoral research at Nova Southeastern University and presently holds a core faculty position at Capella University. Dr. Suzanne Richins is known as an early adopter of technology and innovation. As a senior leader in healthcare, she was one of the first to look at using analytics to structure staffing schedules based on patient arrival acuity to the Emergency Department for her master’s thesis. The methodology was adopted throughout Intermountain Healthcare and various other well-known healthcare systems. While serving on the American Hospital Association Board and The Joint Commission Advisory Committee, she conducted her dissertation on patient satisfaction prior to the adoption of these standards by both of these respected organizations. Her latest work is in using analytics to predict patient outcomes and improve quality. She also teaches doctor of business administration (DBA), doctorate in healthcare administration (DHA), and doctorate in nursing practice (DNP) students for various universities. Suzanne earned her nursing degree from Weber State University, her professional arts degree from St. Joseph’s College, her MBA from Utah State University, and her doctorate in healthcare administration at the Medical University of South Carolina. She earned her degrees while advancing from staff nurse to manager of the operating rooms, director of emergency and urgent care clinics, director of medical/surgical services, administrator of freestanding surgical centers, and chief operating officer. Due to her varied education and experience, Suzanne currently provides consultation and advising to clients about software for electronic medical records, revenue cycle management, and predictive and retrospective analytics. She is the senior vice-president for healthcare at Global Targeting, Inc.